Step 1: Register online at usroadrunning.com. Step 2: Run/Walk at any location and any day you want. You can use the treadmill, your own course, another race. You can run or walk the event any day, any time, or any place you want. It is not required to receive your package before you run/walk. You can run or walk by yourself or create your own event with family, friends or running group. Step 3 (Optional): Post your photo with your medal. Step 4 (Optional): Post your finish time to USRoadRunning.com. The Foundation for USP7-Related Diseases is a small 501(C) non-profit. 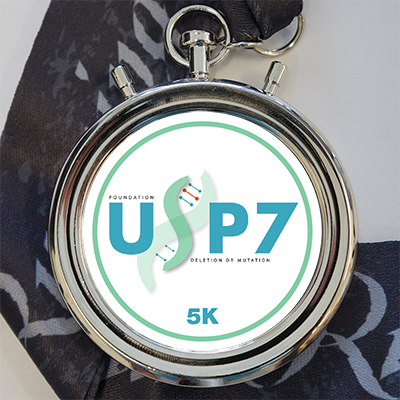 Our mission is to find a cure for USP7-related disease. We do this by funding research and identifying more patients. Our 2018 goal is to raise money to begin a phenotyping typing study. Use of the US Road Running apps. Use of the US Road Running training log. Encouragement from our great Facebook group when you post your finish photos. Support from the US Road Running team by phone or email. Credit towards the US Road Running club. Engraving plates and shirt are add on options. Option 1: Post your photos to our Facebook Group! Option 2: Send your photos to Reta@usroadrunning.com. It is not required to post your time. If you would like to post your time, go to USRoadRunning.com. click on the training log icon on the top of the page. Your race will be listed on your training log. Click post to post your time. How to do Group Orders?